How 11 days of protests brought down Armenia's leader Serzh Sargsyan? The statement from the prime minister’s office came as a shock — for its frankness as much as its content. 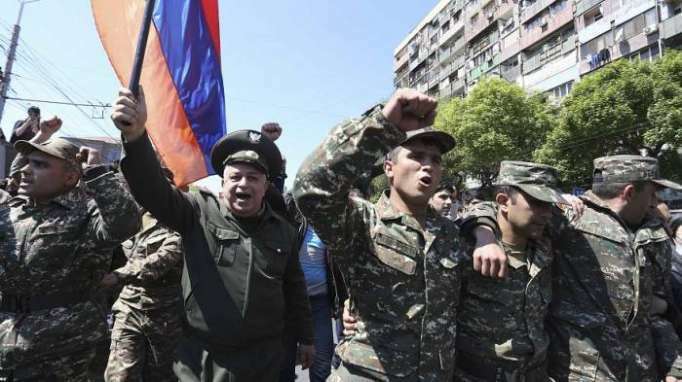 “Dear compatriots,” it began, before addressing everyone in Armenia including “those standing in streets chanting ‘Say no to Serzh’, as well as security forces and politicians. These were not the words anyone expected from so-called strongman Serzh Sargsyan, accused by opponents of wanting to cement his own position of power above all else. What events led up to the prime minister’s resignation? Earlier this month the announcement that Serzh Sargsyan, president for the past decade, would become prime minister — and the country’s most powerful figure — sparked protests that have now continued for more than 10 days. Their goal is specific: to get the longstanding leader to stand down. Led by opposition MP Nikol Pashinyan, various parties and civil groups took to the streets. That did not prevent Sargsyan from being elected prime minister on April 17. His chosen successor as president, Armen Sarkissian — no relation — was sworn in a week previously after also being elected by parliament. 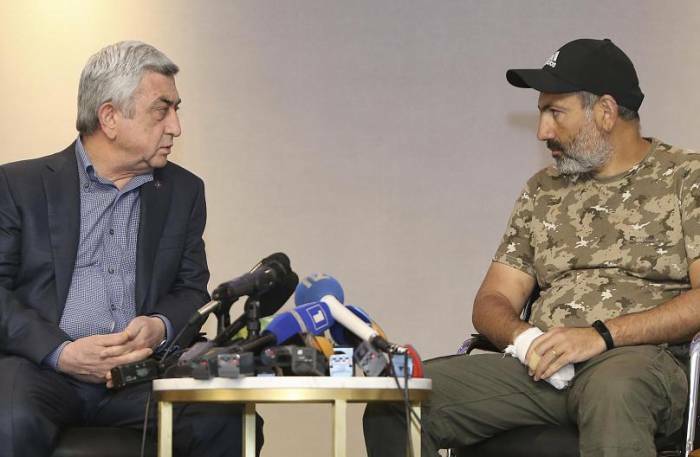 On Sunday (April 22), a day after he saw the new president, Pashinyan came face-to-face with Sargsyan before live TV cameras at Yerevan’s Marriott Hotel after securing a meeting with the premier. It didn’t go well — or last long. After only a few minutes, the prime minister rose from his seat and walked out, muttering about blackmail after his opponent had said he was there to demand Sargsyan’s resignation. Later that morning Pashinyan was grabbed by security forces at the latest protest rally in Yerevan and detained for over 24 hours before being released on Monday, hours before the prime minister’s resignation. Who are the protesters and why have they been so angry? 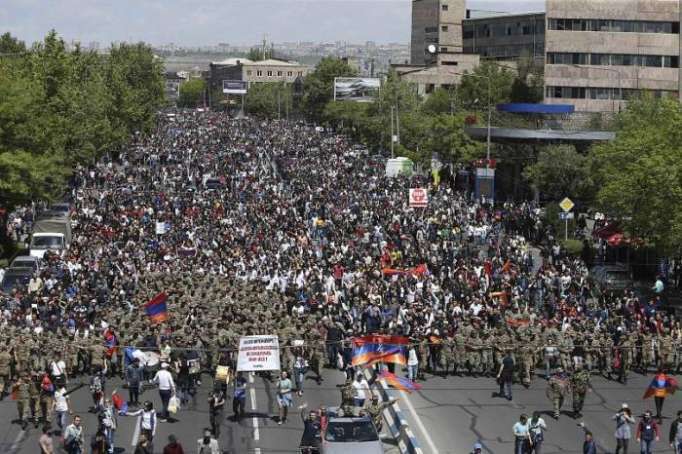 The protesters are described by CivilNet.AM, an Armenian website, as a grassroots movement which is “not led by any one political power”, as well as “highly diverse, having pulled in people from various segments of the society”. Demonstrations have been non-violent, spread around the country and have needed minimal organisation. Even when protest leaders have been detained, people have continued to take to the streets. The now-ex-prime minister’s attempt at a “power grab”, in the eyes of many Armenians, was the straw that broke the camel’s back. It followed years of frustration over social and economic issues, and ultimately the “four-day war” in April 2016 over the disputed Nagorno-Karabakh territory that caused dozens of casualties, bringing Armenia and Azerbaijan close to all-out conflict. Who is protest leader Nikol Pashinyan? Having supported a rival candidate in the 2008 presidential election, he went into hiding amid the unrest that followed, before turning himself in to police. Despite being accused of murder and disorder, after two years in jail he was granted amnesty along with other political prisoners and freed. Pashinyan was elected to Armenia’s National Assembly in 2012 and formed a new political group, Civil Contract, the following year. How did Sargsyan go about his alleged power-grab? Having been president since 2008, Serzh Sargsyan was responsible for pushing through constitutional changes in 2015. Armenians voted in a referendum to move from a presidential to parliamentary system, boosting the prime minister’s role. There were complaints of large-scale vote rigging and outside observers warned that the changes were designed to preserve Serzh Sargsyan’s grip on power, as he would be eligible to become prime minister at the end of his presidential term. This has duly happened — albeit briefly. Observers drew parallels between Armenia’s so-called strongman and the Russian president, as well as Recep Tayyip Erdogan in Turkey. After completing his limit of two presidential terms, Vladimir Putin became prime minister of Russia in 2008 before returning to the presidency in 2012. Erdogan graduated from years as prime minister to become president, with beefed-up powers. Sargsyan has a close relationship with Putin, which critics say has made Yerevan too tied to Moscow.